Located conveniently on Airport Road, near the King Khalid airport, this business centre combines the feeling for a formal business atmosphere with casual corporate culture. This brand new office space boasts bright and spacious work stations with affordable rates and under flexible terms. Work stations benefit from a range of high end in-house services including telephone services, administrative support from a multilingual team and a reception service to take care of your daily needs. You will have access to high speed internet, telephone systems and printing/copying facilities. 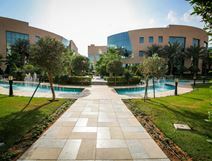 The surrounding area also offers cafes, meeting rooms and a 4 star hotel for the convenience of your visiting clients and guests. Contracts are flexible and month-to-month, making the space ideal for new companies or companies with high growth. Offices come fully equipped and ready to use, with access to meeting rooms, high speed internet and printing areas. The building is accessible 24/7, making your workspace as flexible as you. In the retail level of the building, you can find cafes, a bank, and other services which are within walking distance. This is a sought-after space owing to its accessibility. Surrounded by many transport links, several restaurants and other facilities including a shopping mall this building is located within the heart of the city on the intersection of Olaya & Tahliya Street. These accommodating, fully furnished and serviced offices are available in a variety of sizes to suit a wide range of business requirements. An impressive centre situated in a large tower building, offering a range of office-space solutions at affordable rates. Amenities include meeting rooms, high-speed WiFi, disabled access and a secure underground car park. The work-spaces also benefit from plenty of natural light as well. Transport links from here are substantial and easy to navigate, giving tenants freedom to travel wherever is required. Amenities can also be found nearby including several supermarkets and cafes. This business centre is a new addition to the Riyadh real estate market, offering a fresh new solution to business spaces, whether you are a new start-up or a well established enterprise. Found in the heart of the business district there are plenty of opportunities for networking with neighbouring businesses. 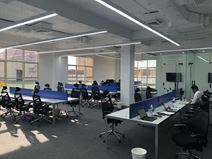 The centre offers a range of fully-furnished work spaces including offices, office suites with meeting rooms, coworking spaces with hot desking and virtual office options. Your business can surely benefit from this centre's 24-hour accessibility, so you can work through the hours you desire. This site also has administrative and IT support to help your business stay well connected, and operating as efficiently as possible. Within walking distance you'll find many day-to-day amenities to make use of including; local restaurants, cafes, supermarkets, hotels and a local hospital. Benefiting from a fantastic location in the heart of the city of Riyadh, these furnished offices have a range of great on-site facilities including a restaurant within the building, a beautiful air conditioned interior and reception services. This accommodating turnkey solution comes with 24-hour security in the building so you can work with peace of mind. With reception services, high-speed internet and air conditioning, this space is ideal for entrepreneurs, start ups and small businesses ready to flourish. 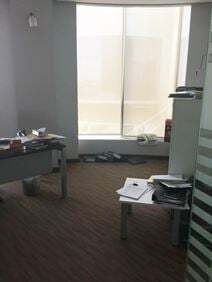 Ideal for start-ups or small companies this centre has a great location on King Abdul Aziz Road and provides plug-and-play, fully furnished office space within a new building. A range of amenities are available including reception services, air conditioning and a huge car parking area. In addition, you can host conferences, conventions and presentations at the nearby events space, just 5 minutes away from the centre. Offering a great selection of modern, affordable and flexible office solutions in the heart of the country's financial hub, this convenient address is located on a main arterial throughway, giving you easy access to the building. Offices are well furnished and equipped to the highest standard, with high speed internet and plenty of natural sunlight. You can also access communal areas including the terrace and an on-site coffee bar. This fabulous office area is housed within the AI Faisaliah Tower, a notable landmark in Riyadh. There is a five star hotel as well as numerous shops, restaurants and cafés within the tower itself. Convenient location in the heart of the city's diplomatic quarter which provides quick access to a number of government offices, embassies, ministries, other business offices, retail shops and an entertainment venue. This serviced office space benefits from a great location at the heart of Riyadh's new commercial center where King Fahad Road and Olaya Street meet. There is an events centre in walking distance for conferences, and the centre's turnkey solution provides ongoing provision for designing, managing and more. Close by, there are many amenities, such as restaurants, cafes and shops to explore outside of work. A beautiful office building that provides quick and easy access to King Fahed Road. Offices are fully serviced and furnished and are in the heart of the business district. Meeting rooms are available, and range in size to accommodate any group for client meetings, conferences and presentations. Meeting rooms are available, and range in size to accommodate any group for client meetings, conferences and presentations. The latest videoconferencing technologies are available. A virtual office service deals with call handling, mail forwarding and administration in the name of the business. Located on King Fahed Road the Moon Tower found in the central business district of Riyadh offers 27 storeys. You will find yourself neighbouring several multinational companies which will allow you to expand your professional networking and business contacts. Excellent public transports will make your commute easy with trains passing through the area frequently. There is also on-site car parking available to make your drive more convenient. 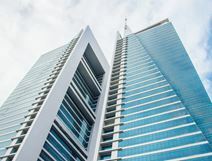 This accommodating office for lease is in a popular complex which has been voted "Skyscraper of the Year 2002", which will surely establish a prestigious presence for your company. There is an exclusive shopping mall, 5-star hotel, exhibition and conference centre, wedding hall and residential apartments within the same complex. The office is situated in an outstanding location surrounded by banks, restaurants, pubs/bars, hotels and golf courses. Offering a fantastic selection of professional and modern office spaces, this location is a great place for professionals and creatives to expand and develop their business. The building offers a range of space solutions, ranging from private offices and co-working areas to meeting rooms. Offices are well equipped to a premium standard and benefit from high speed internet as well as 24 hour access. Stylish office space providing exceptional business support services and amenities such as meeting/conference rooms, lovely reception area, state-of-the-art communication technologies and full-time security. Invaluable assistance, guidelines and local knowledge are provided by professional staffs. This office space is located in downtown Riyadh with quick access to shops, cafés, restaurants and hotels. Located between the Kingdom and Faisaliah towers, this prestigious business address is surrounded by luxury hotels and retail complexes. The centre provides stylish fully furnished offices to meet the demands of modern-day business. A full range of amenities is available to clients so it can accommodate businesses of any background. Here, you can take advantage of a modern design that is fully-equipped for cutting-edge performance. This center offers serviced offices on an all-inclusive monthly fee. The property is easy to access in the heart of the business district. Surrounded by other companies, banks, hotels, restaurants and more, you can benefit from a wide range of amenities; there is an exhibition and convention centre nearby where you can host networking events and conferences. At this accommodating turnkey solution, there is copy and printing facilities, as well as 24 hour access and security, postal services/mail handling and an all-inclusive fee. Part of the Golden Area CBD of Riyadh City, these towers are in close proximity to a number of retail opportunities as well as government institutions & ministries. They also provide stunning views over the city below. The centre is very close to many transport links, and its popular area contains an abundance of restaurants and cafes where you can accommodate your clients. There are also fitness centres and museums in walking distance. The terms of this attractive centre are flexible and suit you. With furnished offices and an abundance of natural light, this space is guaranteed to keep you motivated and productive. High speed WiFi and telephone lines will ensure you can work efficiently and effectively while staying well connected, with the ease of telephone extensions. Utilities come free, with an all-inclusive price to make things easier for you. There are plenty of local and global companies housed in the centre, giving you plenty of networking opportunities and chance to expand your business contacts. These exceptional offices enjoy a prime location in a business park with good transport links to the surrounding towns and the airport. The park is home to a range of major businesses and enjoys access to a variety of lifestyle amenities. There is a choice of useful amenities just outside the centre including restaurants, hotels and coffee shops, as well as a large convention centre that regularly brings international visitors to the park. 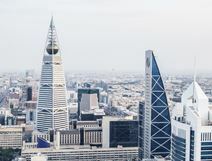 The premises are among a substantial business community consisting of banks, manufacturers and public sector organisations, ideal for networking or simply establish a presence in Saudi Arabia’s largest city. A modern tower block featuring a dynamic centre spanning across several floors. The tower building is the 4th tallest building in Riyadh and the emblematic design sparks innovation and creativity for all tenants. Amenities include; high-speed internet, meeting rooms, conferencing and a parking facility. The location is ideal, with two major roads leading from the tower block, enabling tenants to reduce commuting times. There are also several restaurants, cafes and supermarkets in the surrounding areas.